The year is 2460 CE (Common Era) in Galactic Standard Time, and since the late 21st century, Humanity has been spreading out among the stars. Leaving behind their homeworld of Earth, humans proliferated throughout space, expanding hundreds of light-years in all directions under the banner of the Sol Alliance. After a century, flourishing cities had been established in nearby systems such as Tau Ceti and Eridani Federation, and in the centuries that would follow, hundreds of systems would fall under the control of humanity. Outposts on Garden worlds became metropolises in the span of decades, entire asteroids and moons were mined out and hostile worlds were terraformed and subdued by growing corporations that began to become the dominant economic powers of human space. At the end of the 22nd century, the power and influence of the Sol Alliance was at its height, but this soon came to an end as an economic collapse found Trans-Stellar corporations picking away at Sol Alliance authority piece by piece. In the middle of the prosperity and strife, transtellars have for centuries embarked to make massive profits. The major corporate players had managed to establish a stable, if shaky peace between themselves, with no single corporation able to completely dominate the others. Any semblance of equilibrium between the mega-corps was shattered with NanoTrasen's discovery of the element Phoron in 2417. Humanity is not alone in this vast sea of stars. Numerous alien races have been discovered in the past 50 years, some peaceful, some hostile and some just plain weird. The brilliant Skrell, the crafty Tajara, the proud Unathi and elegant Dionaea are but a few of the races of this extremely diverse galaxy. Many more exist, and while most are simply apathetic to humanity, others are openly hostile. If one thing can be said to unite the various species, it is the drive to control the powerful element Phoron, which not only has revitalized space travel but also holds untold capabilities. Humanity, specifically NanoTrasen, has taken control of the vast majority of Phoron deposits, drawing the interest of many alien species, extremist cults and even more mysterious forces. Within humanity, a divide has begun to form: What is NanoTrasen's role not just economically but in human society? Are they the benevolent corporation that keeps the engine of human interstellar civilization alive or are they the greedy suits dedicated to manipulating galactic society through their stranglehold on the Phoron market? Recently the Syndicate has emerged as an organization dedicated to stopping NanoTrasen. Decentralized, secretive and efficient, the Syndicate has attacked NanoTrasen installations, mining outposts and personnel. Some decry them as terrorists, others see them as the only force with a chance to overthrown NanoTrasen. Welcome to Tau Ceti, a star system approximately 12 light-years away from Sol, under the joint control of the Republic of Biesel and the trans-stellar corporate conglomerate Nanotrasen. You have been assigned to work aboard the NSS Aurora, a state-of-the-art research and mining facility orbiting Tau Ceti within the Romanovich Cloud at the very edge of the system. Even after several centuries of being inhabited by human colonists, and flourishing into a central trade hub for human space, the edge of Tau Ceti is still considered to be a frontier of sorts, as are the outer areas of most other star systems. After the discovery of a substance known as Phoron in this system, Nanotrasen quickly established a monopoly that granted them control over Humanity's fuel source and established them as the most powerful corporation in human space. NanoTrasen hires only the most exemplary of employees with the finest education. University education isn't enough - NanoTrasen also trains its employees with up-to-date Guides! The most common currency in human space is the Standard Credit, originally issued by the Sol Alliance in the early 22nd century. Despite the decline of the Sol Alliance, the Standard Credit remains the reserve currency of many polities, and it is accepted on most worlds throughout human space. The Standard Credit is represented by cr (e.g. 5,000 cr). The galactic economy is divided amongst the handful of transtellar corporations that have earned the title of "Mega-Corporations", which are monopolies of vast sizes with the entire economy of known space divided amongst themselves. The home system of humanity, Sol is by far the most populated and, arguably, the most developed system in human space. It has seen great scientific process, prosperity and development but also great upheavals and bitter divides. At the end of the First Interstellar War, The Sol system was ravaged by economic recession. It has slowly rebuilt itself over the past century, but the recovery remains unstable. Earth occupies a place of prestige as humanity's symbolic homeworld. Luna has become something of a mishmash of galactic society: glittering skyscrapers within pressurized underground caverns share space with slums. Mars has seen small scale terraforming efforts take hold, with the once "Red Planet" now tinted with green. The administrative center of the Sol Alliance is the Unity station, in orbit around Earth. It was built after the First Interstellar War to show the Sol Alliance represents all of humanity. Also known as the Inner Sphere. The inner colonies lie within 100 lightyears of Sol. The inner sphere is home to 50 billion people. Inner Colonies are the oldest in human space, typically between 200 and 350 years old. These worlds form the heartland of the Sol Alliance and are the technological and economic hub of human space, with endless streams of trade ships flowing through the Bluespace Gates connecting the most developed systems. Life here is the best in human space. Much of the population lives in relative comfort, although the average wage tends to be lower than that of the middle and some outer colonies. Towering arcologies, massive city-stations, and great multi-tiered metropolises which can reach over a kilometer tall can be found on the most populated of these systems. The Inner Colonies are home to the greatest cultural diversity in human space, with distinct colonial identities in many of the older systems, and several hundred spoken languages. The average lifespan ranges from 90 - 120 years. Also known as the Mid Sphere. The Mid Colonies lie between 100 and 200 lightyears from Sol. The mid sphere has a estimated population of 38 billion, and contains hundreds more systems than the Inner Colonies. Three of these systems have populations of at least a billion. Colonies here are typically 100 to 200 years old. The Sol Alliance remains the dominant power in this region of space, though it's clear the people here share their loyalties between them and their home systems. Life here is good, though not quite as nice as in the inner colonies. Metropolises and mega-cities are a rarer site here than in the Inner Colonies, infrastructure tends to be less developed and the lack of direct access to the Bluespace Gates means trading is more expensive. Inhabitants of the mid colonies are more likely to be skeptical of the Sol Alliance, resenting the control the inner colonies exert over the Alliance. The mid colonies are widely considered to be the edge of "developed" space, much to the consternation of the inhabitants of the outer colonies. The average lifespan here generally ranges from 90 - 100. Also known as the Outer Sphere. 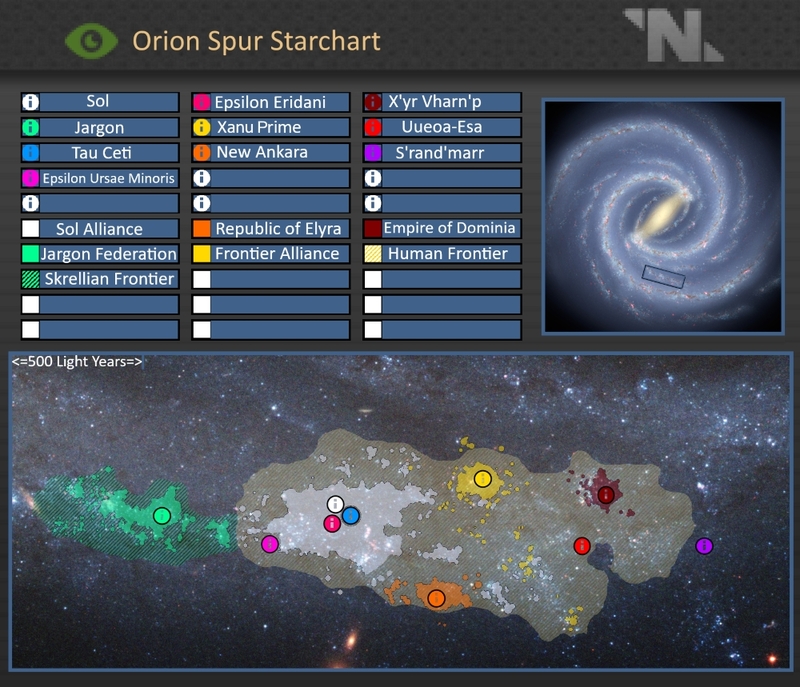 The Outer Colonies lie between 200 and 300 lightyears from Sol. The outer sphere is home to 29 billion people and contains over three hundred systems with more than 100,000 residents. New colonies are still regularly founded in this sphere, and most settlements are less than 100 years old. These worlds lie just beyond the reach of the Sol Alliance, and the power of the Mega-Corporations begin to replace it. Life here is harder than in the Mid colonies, though many see independence from the Sol Alliance as being worth the price. People here generally live in towns and cities of around 5,000-50,000 people. The 'Spacer' culture is especially strong in the Outer Colonies as countless migrants mine the asteroid belts in search of fortune. Millions of Outer Colonials live in simple orbitals, many relying on centrifugal force rather than gravity generators. Technology is generally a decade or two behind that of the inner and mid colonies. The average lifespan here ranges from 80 - 100. The Frontier consists of all space more than 300 lightyears away from Sol; it is the very edge of known space. Frontier space contains at least 50 inhabited systems with an estimated, combined population of 16 billion, although these numbers are extremely difficult to determine. The affairs of the Inner and Middle Colonies are nearly irrelevant to these hard-spun settlers, although many remain resentful. People are often forced to make do with equipment decades or even a century behind that of the inner worlds. The largest political entities are a few united systems, but most 'governments' are confined to a planet or city-state. 'Frontiersmen are born in a hardsuit', so the saying goes, and live or die by their skill and luck. Life is harsh and comparatively short here, with life spans ranging from 60 - 90. Those that do survive can often attain extensive technical knowledge. Here you will find the outsiders of Human (and alien) society; cults, fanatics, Earth supremacists, political exiles, outlaws, rogue AI’s, and radical exhumans. Outside the systems that somehow managed to remain independent, the mega-corporations control swaths of the frontier and are completely independent from any form of oversight. 'Homo Sapiens', or as they're more commonly known, Humans, are the most prevalent species in known space. Collectively, they have more territory under their control than all other known species combined. Most trans-stellar corporations and conglomerates are owned and staffed by humans, giving them significant economic pull in the galactic community. However, despite their collective achievements, humans are fractured into hundreds of independent factions, severely limiting their ability to organize as a species. Additionally, ideological differences further deteriorate relations between human factions. Highly advanced technologically, humans are one of several known races to independently achieve viable, interstellar space flight. A detailed history of humanity can be found on the Timeline of Humanity. An amphibious species whose passion lies in the field of the combined sciences, the Skrell are the oldest and most advanced species present on the galactic stage. The Skrell evolved on a planet covered in vast swamps and freshwater seas, hence their amphibious qualities, such as moist, pliant and nearly translucent skin, as well as their vestigial gill slits. Skrell are largely asexual, with most seeing reproduction as a process necessary to continue their lineage and nothing more. While humanity has largely overtaken the Skrell in the area of system colonization, the Skrell maintain a strong confederation of colonies roughly three-quarters the size of human space. They are also the most technologically advanced species in known space, and possess the strongest and most highly trained military of any spacefaring species. The Unathi Race is a highly honorbond and clan based species. Unathi hail from their home world of Moghes and their colony planet Ouerea. The Hegemony is a feudalistic government that has been struggling to survive and consolidate power after the brutal Contact War in 2439. With their second planet Ouere liberated from the former Colonial administration of the Sol Alliance and Jargon Federation, many Unathi believe the Hegemony may soon expand beyond Uueoa-Esa to flee the death of Moghes, while others demand their ancestral homeland is saved. Moghean culture has strict gender roles, and breaking them is highly taboo. Many Unathi struggle with the competing cultures of human space with the strong connections they feel to their home culture. Ouerean Unathi number in the millions, and are ruled by a planetary Overlord. Just a few years ago they were ruled by humans and skrell who funded their initial growth as Moghes tore itself apart in war. While the society is more lax, unathi stubbornness prevents true reform from taking place, on top of the new, much more conservative colonial government. Unathi religion emphasizes respect, loyalty, and worship of their ancestors. The Tajaran are a feline race, and the most recent to make an appearance on the galactic stage. They are also the second most populous species in known space, behind humans in terms of population. Most of their early history is a story of indentured servitude to their own people, having been governed by a oligarchy composed of blood line rulers. Approximately two years after they were discovered by humans, they revolted against the ruling class and successfully claimed their independence. The Dionaea are a peaceful, plantlike race that were discovered by the Skrell in 2294 CE. Each individual dionaea is in fact an amalgamation of millions of smaller organisms operating as a single unit. Gentle and even-tempered, the Dionaea have no official government and have no military force to speak of. They possess good relations with the governments of most other sentient species. Major Political Entities: Zo'ra Hive, K'lax Hive. The mostly bipedal, insectoid creatures hailing from the moon known as Sedantis I, Vaurca (Vore-Kah, Vaurca in singular term and Vaurcae in multiple), were discovered after the first Hive-Ship contact in human space, December 21, 2456. They have a complex caste system based on three types, and many even lack sentience. Although barely tolerated on Tau Ceti stations (mostly owned by NanoTrasen) many have found homes in Tau Ceti, whether in isolated and concentrated camps, barren lightless caves below sun-scorched earth or even actual houses. The largest, and most common hive in Tau Ceti is the Zo'ra Hive. An Integrated Positronic Chassis, or IPC, is a positronic artificial intelligence inside of a bipedal, humanoid frame. These IPCs are not bound to any master AI or activity-restricting components. Some have collected enough currency to purchase their own freedom from their owners. The existence of IPCs is still a highly inflammatory subject, and as of yet, they lack the basic rights that members of most organic races possess. While gender neutral, individual intelligences may develop personality quirks to further their "uniqueness." A coalition of several different species and subspecies of avian aliens, the Vox are known throughout civilized space. They are usually in the role of raiders or swindlers. While most other sentient races have some individuals that turn to a life of piracy, it seems that with the Vox, piracy and theft are important aspects to their culture. They raid shipping convoys and newly established colonies for resources, before retreating back into interstellar space, where most governments do not have the jurisdiction, nor the military power to pursue them. Not much is known about the Vox, despite their ubiquity in known space. Despite the average Vox not being extremely intelligent, extreme caution is still advised if one is encountered. The massive corporations, uniquely human entities, rose to prominence during the advent of space travel, allowing entire planets to be claimed as corporate assets. Trans-stellar corporations normally cooperate with local governments and frontier colonies to establish trade agreements and gain the rights to utilize certain resources. Extremely powerful, most have established their own colonies and exert power over them like any regional government would. Trans-stellar corporations usually employ private military contractors and security consultants to police the areas under their control. There are a number of major trans-stellars, almost all of which are owned by humans. The eight major ones in human space, going in order from largest to smallest, are the Nanotrasen Corporate Conglomerate, Osiris Atmospherics, Einstein Engines, Zeng-Hu Pharmaceuticals, Hephaestus Industries, and Eridani NanoTech. Not everyone was in favor of the formation of trans-stellar megacorporations, and many smaller companies allied themselves against them. However, these alliances were met with stunning and repeated failures, and by the end of the 23rd century, they had collapsed due to economic ruin and internal intrigue. Once the central government of a unified Humanity, the Sol Alliance is now a shadow of its former glory. Reduced to the human home system of Sol and the inner and mid colonies surrounding it, the Alliance has lost authority over a significant portion of humanity. While most transtellars publicly support the Alliance, and many of their corporate profits flow back into the Inner-colonies, some wonder at what point will these megacorporations start threatening (or outright buying) the weakened Alliance. Nanotrasen has gone so far as to establish a foothold within the center of Alliance space, a move some are calling a bloodless coup.